IMpb, which stands for “intelligent Mail Package Barcode” is a modern way of tracking parcels and additional services through the USPS. It allows shippers to keep accurate tabs on their packages from the time of pickup to delivery. The IMpb has resulted in faster delivery times, reduced handling and far better tracking. One of the biggest advantages of using an IMpb barcode is that companies can take advantage of reduced commercial shipping rates. However, the use of an IMpb is not without its challenges. USPS barcode requirements can be confusing and cause mistakes. Shipping is already an intrinsically confusing and time-consuming task for many businesses. While qualifying for commercial base shipping rates (and the use of IMpb barcodes) is a good way to save money, it can also be just one more source of confusion. In an attempt to adhere to USPS barcode requirements for IMpb compliance, a company must often navigate a virtual minefield of potential mistakes. These IMpb compliance mistakes can result not only in simple frustrations but also a loss of productivity and money for the company. Why is IMpb compliance so challenging? The challenge of IMpb compliance really comes by way of figuring out when to use one and which types of packages actually qualify. The size of the parcel you’re sending is the biggest factor in determining whether or not you need an IMpb barcode. Depending on the weight and dimensions of your item you might be able to get away with shipping a simple letter or envelope. Generally speaking, bigger items will need to be shipped in larger envelopes, larger parcel packaging or USPS flat rate packaging. All of these options will require a shipping label and you can use an IMpb barcode. The following infographic outlines USPS barcode requirements in a clear flowchart. It helps break down all of those shipping weight requirements and package dimensions, and it makes for an easy to follow IMpb compliance guide if you’re shipping simple packages. What about all of those varieties of mail classes? Are they created equal? USPS barcode requirements vary based on the mail class, so we’ll briefly touch on which types of packages require an IMpb. First off, any package that’s being shipped commercially using CBP (Commercial Based Pricing) or CPP (Commercial Plus Pricing) rates absolutely requires an IMpb barcode on the label to meet IMpb compliance. In this case, it doesn’t matter what price category, shape or size the item falls under (including flat rate boxes and envelopes). The list of items that do not require an IMpb barcode is relatively small, and primarily includes periodicals and standard mail marketing such as product samples. A Shipping Services file (a file that is sent electronically to the USPS which contains all pertinent shipping information) that is a version 1.6 or higher. Any package that’s shipped commercially must submit mailing information electronically using a Shipping Services File. Each file contains the required details about the parcel, including piece-level details, mail class, processing category, mailer ID, payment account number, transaction ID and the method of payment. These files must be transmitted to the USPS at the end of the shipping day in order to meet IMpb compliance. Yeah, but how do I actually print the IMpb barcodes? Knowing which packages require IMpb barcodes is only half the battle in meeting IMpb compliance. You’ll still need the right equipment and software to physically print the labels. The two vital components any business will need to accurately print IMpb barcodes is software that can compile the appropriate information contained in the shipping services file, and a high quality printer capable of printing the IMpb barcodes. The SendPro solution from Pitney Bowes makes the process of meeting IMpb compliance extremely simple for businesses who do their own shipping. The SendPro software eliminates the need to know the rules of IMpb compliance and simply prints the correct label, regardless of how you plan to send your package. It doesn’t matter if you plan to ship via USPS, FedEx or UPS, the SendPro solution will print the appropriate label with an IMpb barcode. Keep in mind that many times these shippers use integrated services. FedEx and UPS may route their packages regionally only to have them delivered to the destination via USPS. The requirements for successful label printing and shipping doesn’t stop at the software, though. Obviously, an organization will need a quality scale and printer, and the SendPro solution provides both. Both the scale and the printer are simple to use and plug directly into a computer via a USB port. The scale will accurately weigh packages up to 10 pounds. If an organization finds itself needing to ship packages larger than 10 pounds, the SendPro networked solution comes with a more robust scale that can weigh packages up to 70 pounds. The printer is capable of creating professional labels for each shipping carrier your organization might use. For maximum effectiveness, Pitney Bowes suggests providing a SendPro solution for every team member that will be shipping in the organization. IMpb compliance is riddled with opportunities to make mistakes when shipping. The SendPro solution eliminates mistakes that happen when shippers don’t understand the rules. Those IMpb compliance mistakes are more than just an inconvenience. Seemingly simple errors like delivering to the wrong recipient, incorrect addresses and blank package dimensions can quickly add up and cost the organization unnecessary dollars. Not only do these mistakes cost money, but they also reduce productivity and can hurt customer relationships. IMpb compliance certainly has its share of complexities, but Pitney Bowes has eliminated those complexities with the SendPro solution. 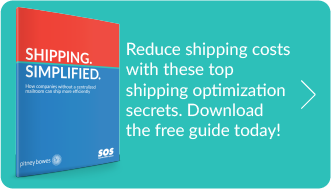 If you’re looking for more shipping tips and ways to maximize your process, check out this helpful guide: Shipping Simplified.